The best bit of the best cliff in the world. This is what dreams are made of: a sweep of rock so steep and so severe that most people run away scared. There is a section of this cliff where 15 consecutive routes are E5 and above. Despite the Big Boyz feel to the place there are several outstanding routes in the lower end of the extreme spectrum and even a couple easier than that. The rock is generally good, but it sometimes takes the sun to rid the crag of a damp feel and frequently conditions are best just after the sun hits the crag in the late morning. The first routes on the southern part of the main cliff are accessed via the path from South Stack towards Holyhead mountain. Just after you pass the radar station and just before you get to Holyhead mountain a track leads down to the racking up spot, above a gully. The top of the gully is under cut massively and not a good place to stand and admire the view. Descend the gully and then follow the path below the Upper Tier to a fork that leads down to the sea-level traverse which is tide-dependent for all the routes beyond the Gogarth Pinnacle. Access by the competent to the far end of the Main Cliff is possible by approaching as for Easter Island. Take a spare rope. Continue toward Main Cliff and slightly downhill to reach the large boulder where you would coil up after escaping this side of MC. Abseil 70>100′ from a block on the top of the escape gully to a belay on the easy angled grassy area then make a roped scramble to the belay above Mestizo. Set up your spare rope to get to the Hustler bay or Phaedra area. This avoids the long sea level traverse and return walk and allows you to see off a few routes in a day. Not recommended for those new to the cliff. Further to the above, head left from the top of the Easter Island Gully to find this block (see Photo) a 100m ab takes you down to the bottom of Heroin/Phaedra/Hustler as you wish. One or two re-belays recommended to direct the rope. Take water and snacks down to your re-belay and knock off as many routes as you can! To the left (looking out goes) down Heroin. To the right (looking out) sets you up for Phaedra and Hustler. The right hand side of the main cliff is rather broken. A steep slab split by two clean cut grooves is divided from the upper section by a steep grassy rake. The routes starting from the grass rake can be reached either by climbing one of the routes on the lower slab, or by descending the grass rake from the foot of Bezel. Makes the best of the section of cliff right of Interpolator. Start 10m right of that route below a large depression with a shallow groove leading to the left. 1. 25m. Gain the depression and follow the groove for 6m. Traverse delicately left across the slab to vertical cracks which lead to the stance of Interpolator. 2. 35m. Step right and climb the short wall and shallow groove above. Trend right and climb over an overlap. Follow the rake for a few feet until it is possible to exit rightwards. L.E. Holliwell and L.R. Holliwell, 30 March 1968. Takes a shallow groove line in the slabby walls above the grass rake. Start from a large flake embedded in the rake, directly below the groove. 1. 25m. Climb the groove to a niche. Exit the niche leftwards through the bulges and move back right to a good belay. 2. 45m. Climb the shallow corner above then move left across the slab into a crack line. Finish up this. B.Ingle, G.Barrow (1 point aid), 11 April 1966. One of the first routes to catch the morning sun. Approach as for Cordon Bleu etc by a careful scramble down from beneath Bezel to belay as for Cordon Bleu at a large embedded flake in a small grassy bay. Initially takes the obvious rampline (left of embedded flake). 1.25m 5b Climb the rampline leftwards into the corner at 10m – old peg. Layback the big crack on the right to a rest at a horizontal break. Using small sidepulls & undercuts traverse back left, crossing the rampline & move round an arete into a corner. Belay. 2. 25m 5b Climb above the belay up the corner athletically to an escape left. Finish diagonally left up the easier flake crack of Diogenes. 1. 25m 5b. Sunstroke pitch 1. 2. 30m 6b. Move right from the belay around a rib until beneath two cracks running the length of a steep wall. Pull into the right hand crack, climb this by strenuous laybacking until the slab above is reached. Climb direct for a few moves until a balancy move left puts you into the corner system that leads easily to the top. It would be possible to climb the 1st and second pitch together with careful ropework and fit arms. This would give a pretty good and sustained pitch. Nick Bullock, Dan McManus, 19/6/08 pointed at this by Simon Marsh who has done an amazing cleaning job while checking routes for the new guide. Climbs through the obvious red overhangs above the foot of the grass rake, using a prominent triangular niche. A fine route, with good climbing and airy positions. Start as for Interpolator, from the large flake embedded in the rake. There is also a direct start (described below). 1. 10m 4a. Climb down the rake for a few feet then traverse horizontally across the slab on the left to reach a small stance on the arete. Thread belay on left. 2. 25m 5a. Climb up to the right to the foot of a shallow square chimney. Either move left up a flake and step back right into the top of the chimney or climb the chimney directly. Go up the slab above to the foot of a steep corner and protection. Step left onto the arete and break through the overhangs on the left to reach the triangular niche and belay. 3. 20m 4c. Step right on to a short arete and up to a good flake crack. Follow this diagonally left across the final slab to the top. Peter Crew, Ian G. MacNaught-Davis, 3 April 1966. The obvious crack left of Diogenes gives a good route. Start as for Diogenes. 2.40m. 5c. Climb the crack to a big flake at 17m. From its top make hard moves up the crack, a strenuous finale leads to the last moves of Diogenes. Pat Littlejohn, John Mothersele, Sep 1991. Cleaned 29th Sept 07 as part of guidebook work. The immaculate orange face left of Achilles. Sustained climbing in the upper part. Start as for Diogenes. 1. 10m. Diogenes, pitch 1. 2. 40m. 6b/c. Climb the slabby face left of Achilles, then bear right till beside the big flake on that route. Move left and up a groove to an overhang, then break back right to a rest spot. Climb the twin cracks left of Achilles to a peg, then launch up left on a shallow ramp to another thin crack. Pull past the bulge on the right until good holds lead up the final face. Pat Littlejohn, Mark Diggins, Oct 1991. Cleaned 29th Sept 07 as part of guidebook work. 1. 10m 4a. Diogenes p1. 2. 30m 5b. Climb up to the right to the foot of a shallow square chimney (as for Diogenes). Move left up a flake and contine in this line to a corner and spike. Traverse leftwards to belay on Resolution. 3. 20m 5b. Climb the crack on the left to the top of a block. Step right and climb the crackline to easy ground. Ben Wintringham, Marion Wintringham, 23 June 1979. A cheeky route that makes a high girdle of the main cliff in a devious fashion, and has bags of exposure for a straight forward, if somewhat commiting route. Start as for Diogenes from the flake in the rake. 1. 40m 4a. Follow Diogenes to the first stance. Continue traversing, slightly lower, across the arete and descend a short chimney to a good belay at the foot of a steep groove onGogarth. 2. 40m 4b. Climb down for a few feet and traverse across the base of the flake forming the groove. Climb the corner on the other side of the flake and move left along the top of the huge flake to belay at it’s apex. 3. 45m 5b. Step left and make a hard move up the steep wall to attain the foot of the obvious slabby gangway leading to the left. Follow the gangway to it’s end, possible belay, then up a short chimney and across a slab to a large groove. Up this to a stance on the arete. 4. 25m 4b. Either; easily round the corner and behind a large flake to a short groove which leads to the top. Or; The Direct Finish (slightly harder than the rest of the route), from the belay climb the wide chimney for 15m until it narrows, then traverse right to a corner. Climb the corner to a ledge and finish up the cracks behind. Pete Crew, G. Birtles (AL), 21 May 1966. Direct finish D. Durkan, D. Williams June 1968. The foot of the slab and the start of the sea level traverse is reached by following the path from the descent gully. Start 7m right of Emulator at a short flake corner. 1. 10m 4b. Climb the corner to the ledge and move right to belay beneath the crack on the right. 2. 20m 5b. The crack and bulge lead to the belay of Imitator. 3. 35m. The original final pitch climbs the loose ground on the right and is not recommended. S.Reid, W.Parker, 26 July 1981. A fine sustained route up the attractive slab right of Emulator that is something of a dichotomy part bold, part well protected and difficult. When linked with The Eternal Optomist makes a fine day out at the grade. Start 5m right of the Emulator groove. 1. 30m 6a. Gain the thin crackline up and left and climb this with difficulty to the traverse of Imitator. Follow the left hand of two thin cracks past two overlaps. Transfer to the right hand crack and follow this to a ledge and belay. 2. 30m. 4a. Scramble up to belay on the grassy ramp. Al Evans, Geoff Milburn, Ben Wintringham, Jim Moran, 23/7/78. A worthwhile route, which wanders up the slab right of the two grooves and when linked with Bezel on the upper tier makes another fine outing. Start from the foot of Emulator. 1. 30m 4c. Pull over a bulge into a short shallow groove on the LHS of the slab. Climb the groove and step right with difficulty onto the slab. Traverse to the right to a short jamming crack and climb this to a belay. 2. 30m 4b. Step left and climb a shallow groove to a little bay. Move right onto the arete and follow this to easy ground. B. Ingle, G. Rogan (AL), 27 May 1966. Start up Imitator. Climb the groove and surmount the overlap to climb a little finger crack to join Aardvark just below it’s crux. Do this and continue straight up the left hand crack to the top. Martin Crook, Rich Cutler. June 1993. No harder than Aardvark? Cleaned 6th October 2007 as part of guidebook work – seems much harder than the grade given – Gets E5 6b in the Ground Up guide! An amazing feature that feels like it goes on forever, it climbs the obvious right hand groove in the obvious steep slab which forms the lower right hand section of the main cliff. . Climb the corner to the top, remember to save some gear for the top half! Recommend 60m ropes if you don’t want to belay on crud. P. Crew, B. Ingle. 10 May 1964. A good route based on the arete between the two grooves. Start on the LHS of the arete. 1. 10m 5c. The stiff overhanging groove leads to a ledge and belay. 2. 40m 5b. Move rightwards around the arete and follow cracks to the top. B. Wintringham, P. Jewell, 10 July 1978. Cleaned 6th October 2007 as part of guidebook work. The left hand groove in the obvious steep slab which forms the lower right hand section of the main cliff. P. Crew, B. Ingle. 3 May 64. At low tide, an easy sea level traverse gives access to the main cliff. At higher tides it is necessary to climb over the Gogarth pinnacle. A sea level start to Diogenes. 1. 15m 5b. Start up the overhanging crack of Resolution. Exit rightwards where this bears left to gain a sloping belay stance. 2. 30m 5a. The steep crack on the left and green slab above lead up to join Diogenes at the belay at the end of p1. J.Kingston, D.Mossman, L.R.Holliwell, 12 Oct 1969. Takes a line up the arete right of Gogarth. Start from the overhanging bay left of the groove of Simulator. 1. 40m 5b. Climb the obvious overhanging crack in the brown rock on painful jams until it opens out into a chimney (Razor Blade Crack). Traverse left along the obvious diagonal break under the overhangs until a difficult move leads to the arete. Climb straight up into a clean cut groove which leads to the good belay of Gogarth, at the foot of the groove. 2. 25m 5b. Climb the overhanging wall just on the left of the arete for about 10m. Move right with difficulty across the arete and into a good crack. Follow this to a good flake and belay. 3. 25m 5b. Climb the crack on the left to the top of a block. Step left with difficulty into a shallow groove and climb this and the bulge above. Follow the crack to easy ground. P. Crew, G. Rogan, 31 Dec 1966. The wall and grooves right of Resolution Direct. Follow the crack right of this up to a wall below the first roof. A few thin moves brings the roof. Lunge out of the right side of the roof to good holes. Attack the following roof via the crack that leads to the small corner. Hard moves lead to easier ground which is taken to a ledge right of the Resolution belay. Mike Twid Turner and Stuart McAleese, May 2006. One of the best E2s at Gogarth. 1. 43m. 5a. Start down and right of the first pitch of Gogarth. Climb juggy rock then the crack in the arete to join Gogarth briefly at the shallow groove. Up this then the corner/groove above until moves left gain a belay ledge tucked in below a steep arete. 2. 48m. 5b. Gain the awkward crack in the arete from the right, climb it past a trying section to reach a flake crack on the left. Up this (possible belay for masochists) then launch leftwards up a tricky groove which leads to easier ground and large spike belays. .
An ambitious girdle of the impressive central part of the main cliff. Start as for Resolution Direct. 1. 25m 5b. Join Gogarth and follow this to the stance at the top of p2. 2. 25m 5a. Follow Falls Road p3 until a ramp leads down to the good stance below the Rat Race chimney. 3. 20m 5c. Descend halfway down the bottomless groove on the left (Alien). The second can protect the down climb by using the large spike on the left. Follow the weakness leftwards to a no-hands rest in a niche (Skinhead Moonstomp). Continue leftwards to belay on Dinosaur. 4. 15m 5b. Move left into Mammoth and follow this to the belay atop p1. 5. 37m 5c. Follow the steep diagonal crack leftwards to gain and follow Citadel p2 to the belay. Mick Fowler, John Stevenson, Sep 1976. Climbed after the third attempt over 2 years. A fine route with varied and interesting climbing. Start on the right side of the large pinnacle at the right hand end of the main cliff. 1. 20m. 4b. Up the wide crack in the corner to belay on top of the pinnacle. 2. 20m. 5a. Step back down a little, then briskly rightwards across a steep wall and around the arête to the sanctuary of a shallow groove. Up this, bearing left around an overlap, then move left to a large sloping ledge directly above the previous belay. 3. 35m. 4c. Climb the short crack above the left end of the ledge then trend rightwards to a good ledge (possible belay). Up the steep groove, the right side of a large flake, to a stance on top of the flake. 4. 40m. 5b. Go rightwards (7m) to a ledge below a steep crack. Up this, not as positive as one would like to start with, then continue in the same line to the top. Baz Ingle and Martin Boysen (1 pt aid), 4/4/1964. This and Shag Rock, climbed on the same day were the first recorded routes at Gogarth. 50 year anniversary thread here. A 70s eliminate based around Gogarth. 1. 20m 5b. Diagonally left from the start of Gogarth across face of pinnacle. Line not that obvious till you get on it and the moves up to the arete seemed hard for 5a. 2. 30m 5c. Short and sharp direct off Gogarth pinnacle then nondescript climbing slightly left to the Gogarth belay, climb diagonally right to a groove, exit left to a belay at the base of the big flake on Gogarth. 4. 30m 5c. A really good exposed pitch with no green hair to speak of. Start up and right as for the last pitch of Gogarth but take the first groove/crack you come to. It gets steep and exposed and feels committing at one point although there is decent gear. Ben Wintringham, Marion Wintringham, 15 June 1979. A tennies eliminate based around Gogarth. 1, 22m 6a.From the start of Devotee, swing out left under a small roof and climb the steep light grey groove to rejoin the parent pitch to the top of the pinnacle. 3,45m,6a. Crux pitch and good climbing. From the tip of the big flake, step left below the crack of Resolution original and gain a steep grey ramp. Leftwards up this for a short distance gaining a small ledge above the first short crack holding good gear. Take an obvious sharp and steep left facing flake crack to gain a rest just down and left of the big pedestal flake on Resolution. Climb the front face of this via awkward and pumpy climbing to gain an obvious undercut spike and so gain huge jugs below the final crack of Resolution…follow this to summit. Tim Neill, Andy Teasdale, May 2016 (Twid climbed the first pitch previously). A 90s eliminate based around Gogarth. 1 23m. 6a. 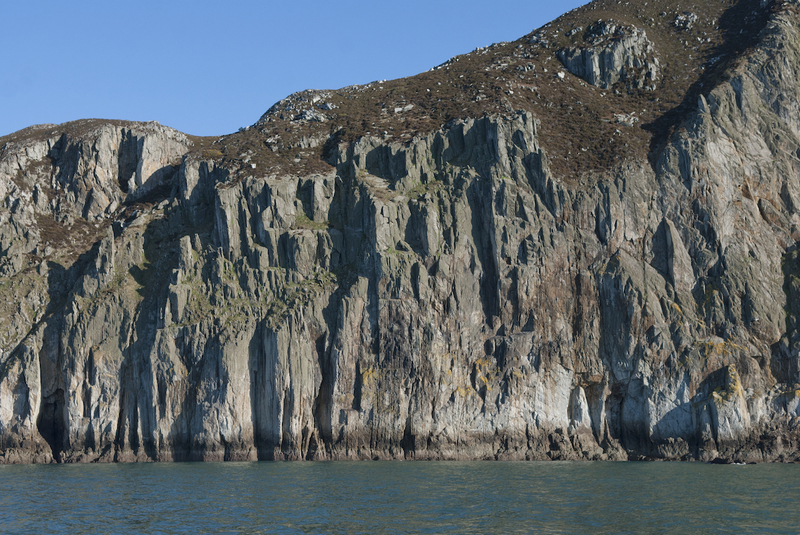 Climb the overhanging crack in the front face of the Gogarth Pinnacle. Well protected but strenuous. 2 20m 6a. Start in the crack of Falls Road and after 8 metres, climb up and right via sloping holds to the right hand side of a sloping ledge. 3 18m 4c. Ramble and climb to the base of Gogarth, pitch 4 (the big corner). 4 45m. 5c. Climb the obvious flaky crack to its junction with the top pitch of Gogarth. Finish as for Gogarth. Mike Turner, Louise Thomas, Graham MacMahon. Nov 1994. 1. 15m 5a. The wide crack in the LHS of the front face of the Gogarth pinnacle. Belay on the large ledge on the left shoulder. 2. 20m 5c. Climb the twin cracks in the red wall initially up the right hand, swapping to the left hand to reach the belay ledge of Gogarth. 3. 40m 5a. Trend leftwards to the large block and climb the corners above to belay on Cordon Bleu. 4. 25m 5c. The obvious wide crack in the wall above gives an exciting finale. John Gosling, E Thurrell, B Sullivan, B Cardus (6 points aid) 6/Sep/1969. Second ascent Ray Evans and Chris Rogers, 1971. FFA Pete Livesey 1970s. A good strenuous first pitch, but the second pitch is very overgrown. Start from the first stance of Rat Race, a ledge on the pinnacle. 1. 25m 6a. Follow the steep groove on the left of the ledge to a respite, then steep again above in a good position to gain a smelly ledge. Continue up the easier groove to gain ledges and a mediocre belay on the right (friend 0, couple of ok wires). 2. 25m 5c. A bit of a blind alley. Step back left and follow the technical groove for a few m. Either attempt to follow the original line, left across the thin totally lichenous slab to the top of the Rat Race chimney, or bail out right to unprotected but easier overgrown rock up to a belay on Cordon Bleu. The cleaner continuation groove is the obvious line but desperate and unprotected. Ray Evans and Chris Rogers, 12 June 1971. Rogers was seconding with a transistor radio and one of the records played that day gave the climb it’s name. Good climbing with some very impressive scenery. Start on the large ledge to the left of the Gogarth pinnacle. At high tide or in high seas the traverse around the base of the pinnacle is inadvisable and the start of pitch 2. can be reached by climbing over the pinnacle (via Gogarth pitch one). 1. 12m. 5a. Steeply up the wall just to the left of the pinnacle to the large ledge on the pinnacle. 2. 30m. 5c. Step left and climb diagonally left to a tricky move up at 8m. Continue in the same line reach and climb an open chimney to a curving overlap. Follow this leftwards and up in a fine position; steep, strenuous and usually seeping. Continue up right onto a steep slab leading to a well-positioned stance. Great stuff. 3. 25m. 5b. Climb the intimidating brown chimney directly above, exiting rightwards. Up the slab to belay on Cordon Bleu, to the right of the tip of a large flake. 4. 20m. 4c. Shuffle down and right to climb a steep groove, the left side of a large flake, to a stance at the top as for Gogarth 3rd belay. 5. 30m. 5a. Go back down slightly and left across the wall to a crackline. Up this, following the right branch. Move left around a rib to an easier crack, up this belaying well back. Joe Brown and Pete Crew (24 July 1966) – several competing teams involved, hence the name. The main pitch was climbed by J. Brown on 8 July, the third pitch by M. Howells and B. Whybrow on 23 July and the fourth pitch had been climbed previously by M. Boysen and C. Bonnington in 1965. A proper route! A good first pitch, the best section of Positron and a stupendous 3rd pitch. Start on the large ledge 3 metres left of the Gogarth pinnacle as for Rat Race, Positron. 1. 35m. 6a. Climb steeply, bearing slightly rightwards then slightly left to the Rat Race traverse. From 5m along this, climb a shallow black groove, stepping left at its top. From a pillar up and R (cam), climb the short, ridiculously steep, golden wall, pulling left into the easier angled groove with some difficulty. Up the groove to the second Rat Race belay. Ideally, belay in an excellent position on the arete (good spikes and medium Friends) to prevent snagging in Positron crack to give a fine view of the following pitch. 2. 30m. 6a. As for Positron, pitch 3. Reverse Dinosaur to belay at an old peg, level with the Positron overhang. Large cams and wires for belay. 3. 40m. 5c. Step down and teeter left along the obvious ledge into a groove (on Mammoth) and up this to a small ledge. Go left across the steep wall on the obvious line of holds, or down and left (indirect, but a little easier) into Citadel. Up this to small ledges on the left. Across these and up a short corner (Graduation Ceremony) then move left across a very sloping ledge, around an outside corner to a large sloping ledge and belay. 4. 35m. 5b. Climb the steep groove to the left of the belay to a shallow cave. Take the right hand crack to finish. Alec Sharp and Chris Dale, Nov 1975. P1 previously by Alec Sharp and John Whittle. The Bass Hunter takes a surprisingly independent direct line up the main cliff right of Rat Race and left of Bubbly Situation Blues to finish right of The Rat Race. It’s possible to fish from each belay! Start off the big ledge at the base of Positron after the tricky step around the Gogarth Pinnacle. 1. 20m. 6a. Start at a pocketed crack right of Positron and just left of the start of Ordinary Route. Climb the well protected vague crack until the traverse of Rat Race, climb straight up to the right of the sticking out pillar on Ordinary Route where Ordinary Route goes left. From the right hand side of the pillar, swing up and right to a crack which leads to a juggy finish. Belay on the sloping ledge below a groove. 2. 20m. 6a. Climb the groove until a wild move gets you into a tricky balance spot. Place gear in the groove and swing out right for the Thank Cod hold. A final tricky slab move and a step right reaches a belay on Cordon Bleu. 3. 4b. Climb the Cordon Bleu groove and traverse easily left to belay below the big groove right of Falls Road. Big spike belay which often has slings on for abseiling off. 4.15m. 6a. Climb the big groove for a few metres, then move up and right. A hard move leads up and right to a small corner/crack. (Huge block just to the right overlooking Rat Racegroove). Pull round right and make a hard move up to a slab. Climb up the slab till a 2m stretch right to the top of the Gogarth big groove pitch. (Best to just continue up the next pitch without stepping right). 5. 15m. 6a. Take the steep crack directly, just left of the belay. At its top, swing left and climb the vertical garden till a big boulder emerges! Mike Twid Turner and Dai Lampard, on-sight (AL) 18/8/14. Plenty of sport and moments of fine climbing. Well protected and of good rock quality. Now the lichen has been removed its pretty damn clean. An audacious line and the quintessential Gogarth E5. The difficulties are not as great as they can seem on first acquaintance, especially if one of the easier options is taken on the middle pitch. Start on the large ledge just left of the Gogarth pinnacle, as for Rat Race, Ordinary Route. 1. 18m. 5b. Climb diagonally up and right into a scoop then back left via a flake heading towards the arête. From a ramp on the arête, trend diagonally back right to belay under the curving overlap. (a) 6a. The first ascentionist’s line: pull up to stand on the big juggy spikes, then traverse horizontally left with hands just above the next roof into the groove of Alien. Up this. Exposed, hard, and strenuous. (b) 6a. In the spirit of the original: Continue 10’ further up the wall from the juggy spikes. Move round the arête, level with an obvious rugosity, into the disconcertingly holdless groove. Unexpectedly on-off for a couple of moves. (c) 5c. Cop out straight up or rightwards to join Rat Race. The line of least resistance, but you will have not have climbed Positron. 3. 30m. 6a. Make sure your belayer is positioned so they can see you on the headwall, it’s quite easy to snag the ropes in the crack otherwise. From the spike on the arête, follow the crack across the headwall for a few feet. Steep. Get the gear in, scuttle back to the spike and regain your composure. Admire the view, watch the seals and make a mental note to avoid leading the chimney pitch should you ever find yourself on Rat Race. Re-rack your gear, tighten your boots and indulge in any other procrastination your second will tolerate. Once you have lost any benefit of the warm-up, commit to the wall again. The crack fades, forcing a harder move up. Traverse horizontally left for 10′ to the small overhang. Get on with it here: it’s easier than it looks. Good gear can be had at the overhang but it’s still steep and fiddly to place. One more awkward move up round the left side of the overhang and it’s all over. A few more feet on the same line and you are in the Dinosaur grove. Stitch together an adequate belay and focus your camera on the traverse to the overhang for the 1978 guide cover-shot. 4. Finish up Dinosaur, Cordon Bleu or, for more of the same, the last pitch of Ordinary Route. Alan Rouse and Pete Minks, March 1971 (5pts aid). Second ascent Alec Sharp and Hank Pasquill (1 rest on 3rd pitch), 1971. FFA 3rd pitch Alec Sharp and Chris Dale, Nov 1975 during FA of Ordinary Route. FFA Positron complete route by Ron Fawcett and Chris Gibb, 1970s. Soloed by Stevie Haston in 1986. Good climbing based on the square cut left arete of the lower wall and the right arete of the Positron headwall. High in the grade. 1. 30m. 6a. Start from the large ledge just left of the Gogarth pinnacle. Climb the left arete of the wall to join Positron at the end of pitch 1. Continue up the arete to gain the belay at the end of The Rat-Race pitch 2, below the Positron headwall. 2. 30m. 6a. From the spike on the arête, get some gear in the initial crack of the Positron headwall. Climb boldly up the overhanging right arête of the headwall in a very spectacular position. Belay on Cordon Bleu. I would recommend finishing up Alien. Start by taking the Skinhead Moonstomp corner direct. 1. 18m 6b. Climb the corner direct left of Positron until level with the Positron belay traverse right to belay. This climbs higher than the original traverse and is quite spicy! 2. 12m 5c. As for the final section of Rat Race p2. 3. 30m 6b. Climb the slim pillar left of the Rat Race p3 chimney. The crack in the arête is attacked direct via hard long reaches. A good runner is reached then continue on spaced holes to the Cordon Bleu traverse. Mike Twid Turner and Louise Thomas 1990s. The 3rd pitch is excellent and totally independent of all other pitches. A totally amazing route, one of the best E6 outings on Gogarth. It takes an incredible line up the very centre of the Positron headwall. You get the highlights of Positron and The Big Sleep into the bargain. The first pitch takes the large corner at the base of the Positron headwall. 1.18m. 6a. Climb the corner and surmount a small bulge below where the corner fades into masssive overhangs. Traverse rightwards to reach the belay at the end of Positron pitch 1. 2.40m. 6b. Follow Positron leftwards into the groove of Alien. Continue left (Trunk Line) and up to gain a shallow niche, no-hands rest and good runners. You are now at the very base of the headwall and above you is an amazing soaring flakeline. Enjoy the view. Climb out of the niche to gain the flake and layback up this in a fantastic and increasingly pumpy position. The flakeline eventually peters out at a small flake (very thin sling runner). Continue straight up on face holds to join the headwall pitch of Positron. Follow this leftwards for a few moves (junction with The Big Sleep). Step right and climb a vertical crack which leads to the “bucket seat” belay in the apex of the headwall. Congratulations. It’s best to do a short pitch from the bucket seat belay to belay again on Cordon Bleu before choosing a finish. Second ascent Joe Healey & David Jones 13 May 1984. One of the most striking lines on the Main Cliff. Start up the slanting crackline to the right of the Dinosaur chimney. 1. 30m 6b. Steep bridging up the crack leads to a series of committing layback and undercut moves to reach a small roof (crucial runner). From here, a very un-obvious sequence of blind slaps will probably not establish you in the groove above. Follow this easily to the Positron belay. 2. 30m 5c. Climb the chimney of Rat Race for 8m, then exit left and climb the hard and hairy groove. Follow the slabby rib to reach the belay on Cordon Bleu. 3. 25m 5c. Move right to the base of an obvious crackline and follow this, very sustained, to a difficult move leftwards out of the top of the crack. Pat Littlejohn, Steve Lewis (on-sight) 16 May 1980. 1a. 30m.Climb the diagonal crack in the left wall of the Skinhead Moonstomp corner direct instead of the easy ramp to its left. Mike Twid Turner and Grant Farquhar, (AL on-sight) 1989. Alien pitch 1 combined with Positron‘s 3rd pitch makes for one of the best routes of the grade in the universe. A brutal first pitch and sustained second pitch comprises one of the most obligatory Gogarth experiences. Start at the base of the obvious chimney 10 metres left of the ledge at the base of Positron. 1. 30m 6b. Climb the chimney (often greasy) until it steepens at a small roof (large friend up and right). Swing out left onto the wall (crux) and climb with some urgency (small cams useful) on increasingly better holds to belay on vague ledges just to the left of the continuation chimney (gear up and left for the belay). 2. 30m 5b. Pull rightwards into the base of the steep chimney and follow this, without any particularly hard moves, but extremely sustained throughout, to reach the ledges of Cordon Bleu. 3. 30m 5c. A fine and enjoyable pitch. Traverse rightwards for 5 metres until below a short black wall. A tricky boulder problem leads to a ledge. Arrange gear and swing rightwards into the groove in the arete. Follow this thoughtfully to the top. Pete Crew and Joe Brown, (10 pts aid) 19 June 1966. So called because the route required a “long neck and no brains”. Final pitch Pete Crew and E. Fry 24 July 1966. FFA pitches 1 and 3 (some aid used on the second pitch) Richard McHardy and Paul Nunn AL, late 1960s. FFA entire route Ron Fawcett,1980. A massive linking pitch on Main Cliff at Gogarth. Climb the first pitch of Dinosaur through its crux section but then traverse back right to gain a flake which leads up into the second pitch of The Big Sleep. This monstrous pitch takes you all the way to the bucket seat belay above the diagonal traverse on the main Positron pitch. Anybody who fancies a repeat best get themselves some ‘long and light’ ropes – your old 50m strings won’t reach! An intricate route taking an eliminate line on the second pitch. The Direct Variation is probably the more logical and frequently climbed.The first pitch should not to be underestimated in less than perfect conditions. 1.30m 6a. Climb the chimney left of Dinosaur for 15 metres until it is possible to step left onto the pillar (peg). Climb the pillar and trend leftwards on flat holds into a groove. Continue up the wall on more flat and sloping holds (sustained) to reach the Dinosaur belay. 2. 30m 6b. Traverse rightwards across the chimney of Dinosaur and follow undercuts to a large foothold and obvious flake crack (large wire) approx 15 feet below the overhang of Positron. From here, there are 2 options. Either Original; traverse right to join Positron. Climb the vertical crack in the headwall above to the Bucket Seat belay. Or Direct; climb fairly directly (small wires), just a few metres right of the Dinosaur chimney, with a move rightwards to reach a flat hold at the traverse line of Positron, just to the right of the roof. Turn the roof and trend rightwards to the Bucket Seat belay. Ron Fawcett, Jim Moran, 22 May 1980. Direct: John Redhead, Big Willy 7 March 1982 during second ascent. .Ron Fawcett on the first ascent of the first pitch of The Big Sleep on the cover of the 1981 supplement. The black sheep of the E5 family with a powerful crux sequence on the first pitch and a typically intricate, bold and pumpy second pitch. Start at the left-facing corner between the chimneys of Mammoth Direct and Dinosaur. 1. 35m 6b.Climb the the corner and traverse leftwards below the roof to a rest. Psyche up and power through the bulges above, on pockets (old pegs and big cams), until you can step left as the angle eases into the respite of a small corner. Breathe. Follow better holds left of the groove and climb the wall above, moving right to belay on a good ledge. 2. 30m 5c. Move rightwards from the belay onto a vague rib. Climb up using fins until it is possible to pull left into the groove (peg). Follow this, sustained throughout to exit via the left-facing corner at the top. 3. 30m 5c. Dinosaur p3. Pete Crew, Ed Drummond (6 pts aid) 6/7 May 1967. Second ascent Richard McHardy late 1960s with only one point of aid on the first pitch. FFA Andy Pollitt, Steve Andrews 23 May 1984. Another 80s eliminate in the mould of The Big Sleep. 1. 30m 6b. Start up Mammoth to the roof. Undercut strenuously rightwards to join The Big Sleep and follow this to the stance. 2. 30m 6b. Climb the pillar between Mammoth and Dinosaur to “a path” (the traverse of Ordinary Route). Continue directly up the red wall above to the belay. 1. 30m 6b.The massive vertical chimney slot which bounds the right hand side of the impressive white wall taken by Extinction and Hunger. Sustained climbing with good protection. Steep bridging leads up the chimney and onwards to a junction with the first pitch of Mammoth just before it’s crux. Finish up this. 2. 30m 5c. Mammoth p2; move rightwards from the belay onto a vague rib. Climb up using fins until it is possible to pull left into the groove (peg). Follow this, sustained throughout to exit via the left-facing corner at the top. 3 40m. 6a. Up the short wall as for Dinosaur, then go straight up the open corner above and continue direct to the top. p1 Andy Pollitt and Martin Crook, 26 May 1984. p3 Eddie Cooper, Pat Littlejohn, 21 May 1995. Second ascent of p1 by Nick Dixon and Craig Smith, 1980s. Takes the wall right of Hunger. Climb the wall immediately left of the chimney (Mammoth Direct) until it is possible to move left and up to a flake with good runners. Move left along the obvious line to a spike and runner, crux moves lead straight up to another spike and then to a peg (missing) where improving holds lead up past the roofs to a wild finish. F7c+ climbing with slings on spikes for protection. Steve Mayers, 25 April 1991. Climbed ground-up over a few days by Stuart Cameron and confirmed at E8, 26 July 1993. One of the earliest ground up E8 ascents in the UK. Climbed ground up by James McHaffie in 2015. The pristine lower white wall has a thread in it, which helps with route finding. Wear your shades if the sun is out! 1. 20m. 6a. Climb up a short crack then break out left to gain wonderful pockets and pinches leading to a thread. Traverse left with difficulty, then up to gain the sentry box of Citadel and a no-hands rest. Climb up and right under the roof, which is split by cracks. Arrange large cams and pull blindly over the roof on jams, undercuts and fins to easier ground. 2. 20m. 5c. Climb up above the belay then traverse rightwards, aiming for a corner. Climb up this to belay on a ledge. 3. 20m. 5a. Yawn, yawn, yawn. Make your way to the top of the cliff. Pat Littlejohn, C. King. On-sight, 8 June 1978. One of the top 5 E5s in the UK according to this UKC article. 2a. 20m. An excellent variation for a hungry party. Climb more or less directly up the orange wall above the belay on mostly good edges, with a hard crux past an undercut “the smallest free roof in Wales”. Sustained, but with good gear if you can place it. Crispin Waddy and Johnny Dawes, 5 May 1988. Yet another superb line, the first pitch has a hard crux and the sustained second pitch is one of the finest at Gogarth. Start 2m left of Hunger, about 12m left of the chimney of Mammoth Direct, directly beneath a line of undercut flakes. 1. 40m. 6b. Climb straight up, then bear left with more difficulty to the start of the undercut flakes. Traverse right following the flakes to a niche. Swing out left and somehow climb the leaning wall (antique inverted knifeblade – missing as of July 2012) to gain a sloping shelf. Climb up and right much more easily to a long ledge below the impressive gently overhanging crack. 2. 35m. 6a. Climb the short steep wall then a move right gains the crack proper. Up this, past ancient iron (and aluminium) -mongery, finally reaching a welcome slab. 3. 25m. Easily up the groove to a good ledge and belay on the large blocks on the left. Alpine off. Jack Street and Gordon Hibberd (9 pts aid) 1968. Pitch 1 climbed previously by Jack Street and Geoff Birtles, sometime earlier in 1968. FFA Ron Fawcett 1977. Borderline E4/5. Excellent climbing, if slightly overshadowed by some more famous neighbours. The main event is the crack-line parallel to the second pitch of Citadel. This has a steeper, harder crux but is not as sustained as that route. Start just left of Citadel, below small overhangs beneath a short corner. .
1. 35m 5c. Up to and through the overhang to the short corner. Climb this and swing out left, easier than it looks, then move up left to ledges. Go up a short steep corner to a large sloping ledge (First belay, Big Groove). Belay at the right hand end of the ledge beneath a steep quartzy corner. 2. 20m 6a. Up the corner, then bear rightwards to the crackline. Follow this to some ledges. Continue in the same line over some bulges then traverse right to the slab and belay of Citadel. 3. 25m. Finish as for Citadel. Alec Sharp and Ray Toomer,19 June 1976. Sharp had just finished his final exams at Bangor University. P1 previously by Al Rouse, Mick Geddes in June 1971. Link up: Graduation Ceremony/Big Groove is an excellent combination at sustained E3/4. A good route which it is not difficult to make a meal out of. 1.30m.6b.Start up Graduation Ceremony and climb direct up the awesome groove, through a roof (last gear), and left on to the rib and up this to the Citadel Belay. 2.27m.6b.From the sloping ledge at the base of the main pitch of The Big Groove,climb up the right side of the next groove to the right. Food: Paul Pritchard, Ben Pritchard, on-sight, 14 May 1991. Drink: Adam Wainwright, Crispin Waddy, on-sight, 27 May 1992. Tom Briggs and Adam Wainwright did the first combo 24/6/96. Adam led the first pitch, Tom pulled a ledge off the second and fell onto a no. 2 RP, Adam then took over and led it clean. Second combo ascent G. Farquhar and N. Craine (AL), 8 Sep 1996. A good strenuous line based on the left edge of the main section. Start 3m left of Graduation Ceremony at the base of a short crack immediately left of the arete. 1. 40m. 6a. Climb the crack very strenuously( a fight to get the gear in) to a junction with Graduation Ceremony. Go left and up into a continuation groove on the right which leads to ledges. Traverse right along the ledges and go up a short wall to belay beneath a steep quarty corner, as for Graduation Ceremony. 2. 25m. 6a/b. Climb the corner than break out left onto the steep wall via a slanting crack. Some very hard moves then gain the left arete. Not long now before the holds improve as a traverse back right is made to a sloping ledge. belay on the left at a thread in a crack. 3. 30m. 5a. Climb the groove on the right and the wall above to reach ledges and the top. A good route with a notorious first pitch up the smooth overhanging and often wet crack. 1 35m 6b. Climb the crack and groove above to belay on the The Big Groove. 2 22m 6a and bold. Either climb the original eliminate direct variation up the leaning wall behind the belay (serious) or follow The Big Groove itself to the base of the big corner. Step right to a foothold on the arete and swing around to gain a crack. Climb this to ledges and move right to the thread belays on Sebastopol. 3 27m 5c. Step left and climb the crack and groove to belay at the base of a pillar. 4 18m 5b. Follow the pillar to the top. Jim Moran, Paul Williams, 20 May 1979. Start at the first steep crack right of the start of Pentathol/Big Groove. 1 35m 5c. Climb the crack directly into the brown left-facing corner of Pentathol, continue directly up this feature to ledges. Continue up and right to the belay of The Big Groove. 2 40m 6a. This pitch climbs the very hairy wall to the left of The Big Groove. Trend up and left on good holds to some flakes. Step right into a thin crack and make difficult moves, poor peg, to a junction with Puzzle Me Quick. Ascend the left-facing groove and exit right, around the arête, onto the hairy slab. Escape right into The Big Groove, nut belay. 3 25m 5a. Step back left and follow the arete to the top. Jim Moran, Geoff Milburn, Al Evans 28 July 1978. Above and to the right of Pentathol is a large groove facing left, which is difficult to see from below. 1. 39m 5a. Follow Pentathol p1 to the belay and continue up the short steep corner above to belay on the huge sloping ledge below the main groove. 2. 18m 5c. From the left hand end of the ledge climb a bulge to reach a good spike. Climb up to the right with difficulty to reach the foot of the main groove. Climb this (pegs departed) and the flake crack above to reach a sloping stance with poor pegs. Belay 2m left at the base of p3. 3. 34m 5b. Step left to the foot of another groove and climb this, moving left near the top on to the arete. 4. 18m. Continue easily up blocks and a short crack to the top. Pete Crew, and Dave Alcock (1pt) 18 June 1966. A 3 star alternative…and a better finishing pitch than the original. 3.35m. 5c/6a After the crux pitch of this route take the more direct continuation corner groove/wall. (The original avoids this by taking the crumbling groove/crack out left). Climb the steep wall/corner to a protruding block (fragile and possibly missing; The guidebook description (and most other sources) describe a creaky flake on the main pitch of TBGD at, I reckon, about 6m height. This definitely wasn’t there on friday and the two cruxes before the crack doglegs back into the groove both felt 6a maybe even soft 6b?? The route’s still totally safe (with plenty of RP4s and rock 1s) and not very pumpy, at least not on the arms. Alex Mason, 6th March 2012). Continue up using flakey, but solid, holds to a small ledge on the arete and follow the continuation crack into the corner. Pull up and bear rightwards into a groove which is followed over a bulge to belay on easier ground. 4. The usual Main Cliff plod follows. E. Drummond, B. Campbell-Kelly 27 Sep 1969. 1. 40m 5b. Start as for Pentathol/Big Groove. Follow this along the initial rightwards traverse to the base of the corner. Continue traversing rightwards to join Graduation Ceremony and follow this to the belay of The Big Groove. 2. 35m 6a. From the left hand end of the ledge climb a bulge to reach a good spike (as for The Big Groove). Boldly gain the clean groove (left of the main Big Groove system) directly above with difficulty. Continue to the overhangs above and undercut leftwards to a small corner and junction with The Wastelands. Continue leftwards to a thin crack and climb this to the corner/niche above. Exit directly then trend rightwards to a stance on the arete. 3. 40m 4b. Continue up the arete and easy ground above. Brian Wyvill and Ray Evans (AL) 26 May 1973. Second ascent Alec Sharp 1970s. An enjoyable, juggy romp through some pretty spectacular territory. This route has pretty much a runner and bucket hold for every move. It’s in the same mould as Trunk Line and Ordinary Route…ie it links up easier bits of other routes with only the odd linking move. 1. 60m 5b. Follow The Big Groove start to join Sebastapol then head over to the Citadel/Hunger belay. 2. 40m 5b. Continue up Mammoth and across Wall of Fossils (with feet in the obvious diagonal break) to romp up the last jugs of Dinosaur. Andy Stevenson and Anthony Park, 16th June 1984. Exhumed as Main Wall by Tim Neill and Calum Muskett April 2014. Tim Neill on Mona Complex. Photo Calum Muskett. A nice route with an excellent and varied first pitch. Start about 20 ft right (facing in) of the large square block on the sea-level traverse. Far above and to the right you can see the right wall of The Big Groove. 1 28m 5a. Climb up a white wall for 10 ft and then traverse rightwards boldly across the steep wall, using large flake/spike handholds to move up onto a ledge. Continue right to a corner. Climb up a few feet and then step up into the brown left-facing corner. Climb delicately up the brown wall and traverse left under the quartzy overlap (careful with rope drag). Move up into a second longer left-facing corner. Climb the corner, which is pleasantly sustained, to pull out right at the top onto a sloping ledge with belays. 2 15m 4b. Downclimb the top of the corner of pitch 1 for about 10 ft until it it possible to step across left into a wide chimney/crack. Climb this and the wall on the left to reach a line of flakes leading diagonally up left to a stance below a groove. 3 25m 5a. Climb the groove above, going left around the first bulge, until below a short overhanging wall with a sloping ledge on top. Make surprisingly awkward moves up this and onto the ledge. Climb the short groove/wall to the left to a belay on top on the block. 3. 21m 4b. Scramble up behind the belay, climb the short green groove and continue up grassy slopes and another groove to the top. P. Crew, B. Ingle, 24 April 1964. Start at the same point as for Pentathol/Big Groove. 1. 30m 5b. Climb the narrow and then wide crack on the left. Belay at the base of the wide chimney/crack on p2 of Pentathol, possible feisty Shag nesting. 2. 20m 5a. Climb the chimney and move right on to the wall. Climb the wall aiming for the crack above which leads to the belay of Jaborandi. 3+4. Finish as for Jaborandi. B. Wyvill, R.Evans, 12 May 1973. A very steep route with some interesting climbing, which takes a direct line up the wall on the left of The Big Groove, crossing Pentothal at half height. Start just right of the square block. 1. 35m 5b. Climb over two small bulges into a short overhung corner. Step right to a good spike and continue easily up the ramp on the right. Step left on to the lip of the overhangs and climb a short steep crack to a ledge. Step left again into a deep crack and climb this to join the last few feet of the second pitch of Pentothal. 2. 48m 5c. Step right up to the foot of a bottomless corner and climb this to a good ledge (possible belay). Climb the short overhanging corner behind the belay to a sloping ledge. Climb the ragged crack above until it is possible to move left with difficulty to reach broken ground. Continue up a groove to a large ledge and spike belays. 3. 20m 4b. Easily to the top. Pete Crew, Dave Alcock (4 points aid) 11 June 1966. The obvious diagonal fault that Jaborandi starts up. 1. 34m 5c. starts as for Jaborandi but carry straight up the fine pocketed groove with good protection. A big cam useful as the crack widens. This leads past the Morphine stance to belay on the flakes of Pentathol. 2. 48m 5c. Continue as for Jaborandi to the top.There appears to have been some rock fall where the original line tops out with several fresh scars…take care.Steve Long, Donald King and Tim Neill, April 2016. Steve Long on pitch 1 of Jaborandi Direct. Photo: Tim Neill. Start on top of the prominent square cut block on the sea level traverse. 1. 35m 5b. Start as for Syringe then gain and climb the crack on the right to just below the sentry box of Syringe. Traverse right to belay at the base of a wide crack. 2. 15m 5a. Climb diagonally left to a smooth corner which leads to Pentathol at the top of pitch 2, belay. 3. 45m 5c.Takes an eliminate line 2m right of Pentathol. Gain the thin crack and follow this past bulges to rejoin Pentathol on the sloping ledge. Continue in the same line to the broken ground on Jaborandi and finish up this. Ben Wintringham, Marion Wintringham 5 May 1979. Solid at grade & previousy underrated. Harder than The Needle, easier than Assassin. 1. 40m. 5c. Climb the wall to a rest and good runners (careful with drag) in the overhang. Step right into the sentry box and climb aggressively over the bulge (crux) into the groove above. Follow this boldly (friable) to a further tricky move and trend leftward to a good belay ledge below a short steep wall and overhang. 2. 30m. 5c.Climb the steep wall above into the overhanging crackand follow this to a small ledge/break. Continue up the groove to the left of some bulges to a good belay ledge and large embedded flake/boulder.This is a common belay for routes in this area. 3. 21m 4b. Pentathol p4. Doug Scott and Ray Gillies (7 pts aid) 11 June 1966. FFA Richard McHardy and Davy Jones. Originally called Crewcut when climbed by Doug Scott and Ray Gillies of Nottingham Climbers Club. This was a route eyed up by Pete Crew but he was beaten to it by Doug and Ray. Les Farrah and I were on the aproach to the climb when Crew and his rope buddy appeared and saw Doug and Ray already well up the route. “F***ing Scott” he shouted”. In answer to Doug’s name of the route when the official guide came out (edited by Crew) the route was renamed to expunge the slight to himself. Start below the crack just left of the square cut block. 1. 35m 6a. Climb the crack until it is possible to move left into the chimney. Exit rightwards and continue up the steep crack and groove to easier ground on Hypodermic. Step down right to the belay stance of Syringe. 2. 30m 5c. Step back left to the large flake on Hypodermic. Climb leftwards to the arete and move up to a sloping ledge. The wide crack directly above leads to ledges and belay. 3. 20m 4c. The Needle p3. A. Sharp, J. Zangwill 1 July 1974. Start beneath the corner left of the square cut block. 1. 35m 5b. Climb the corner for 12m then follow the weakness leftwards to the arete. Continue leftwards across the wall passing The Needle for 6m and climb the weakness in the wall above to the belay of The Needle. 2. 40m 5c. Follow The Needle to the crack but quit this almost immediately and step right to gain a large flake (junction with The Camel). Continue over a bulge to join and finish up Syringe. L.E. Holliwell, L. R. Holliwell 20 July 1968. Brilliant climbing, steady for the grade with a short hard bit. Very well protected. 1. 30m 5b. Start just left of the arete, and blast up the steep crack, which quickly eases. The corner above leads to the belay ledge, with a tricky-ish move at the top. 2. 35m 5c. Step off the right edge of the belay ledge with great exposure but loads of bomber kit. Storm up the awesome crack with loads of great gear, and big holds. The final steep bit is pretty tough for a couple of moves, with some wild laybacking. Land on the ledge, and squirm up the wide crack above (friend 4 useful), before a short easy, slightly loose bit leads to a palatial belay ledge. Ray Evans and Chris Rogers, 19 May 1973. Al Evans, Jim Moran 5 July 1978. Some great open face climbing on pitch 2. Start 3m right of Scavenger at the foot of the left of three cracks. 1. 30m 5b. Steeply climb the flared crack then head off rightwards, climbing a big crack or the steep wall to its right to gain the belay ledge shared with The Needle. 2. 40m 5c. Climb the wall left of the belay and moving up and left through a steep section (peg) then move right to big foot-holds. Head back left to the base of the wall with a thin crack (spikes). The wall is steep but small sharp holds allow progress to a point where a span out left gains the sloping left arete. Climbing direct up the wall is much harder (6a), especially for those of normal stature and below. A sloping ledge is reached and the cracks above lead directly to two large spikes below the final crack of pitch 3. 1. 30m 5b/c. Start up The Assassin continue up the crack to gain a belay on the traverse of Scavenger. 2. 20m 5b/c. Climb the wall between Scavenger and Scavenger Direct to the belay of Scavenger. 3. 40m 4b. Scavenger p3. A very good route on perfect rock which takes a line of shallow grooves up the front of the buttress left of Pentathol. Start from the foot of the groove on the left of the square block. 1. 10m 4c. The steep wall leads to a large ledge and spike belay. 2. 40m 5a. Climb the groove above for 10m, step right around the arete and continue right across Hyena to the foot of another cracked groove. Climb this direct to a sloping ledge and flake belay. 3. 40m 4b. Continue up the continuation groove to easy ground. Either traverse off to the left or scramble up and right to join the last pitch of Pentathol. Climb the groove on p2 all the way. The arete left of Scavenger. Pumpy and high in the grade but the difficulties are too short for E2. Start from the bay below the overhanging chimney of Heroin, 15m left of the square block. 1. 15m 4c. Climb diagonally right to the large ledge of Scavenger. 2. 20m 5b. Climb the corner above for 5m to the obvious leftward traverse line and follow this to the arete. Climb a flake on the left of the arete for a few feet then move back right to the obvious crack. Climb this direct to a stance and belay. 3. 40m 4c. Move left into a corner and climb this and broken rock and grass to easy ground. The Night Prowler * HVS 45m. 1 8m. 4c. As for Scavenger, pitch 1. 2 37m. 5a. Follow Scavenger Direct for 16 metres to an obvious overlap. Step up and left to the base of a steep crack which is followed on good holds until it is possible to step left into the bottom of the Nightride chimney/groove. Finish up this. Pete Greening, Nick Sharp, 5 July 1995. Low in the grade. Start at the right side of the bay below Heroin at the Arête between Dream Seller and Nightride on its left side. 1. 30m, 5b…Follow the flake crack up the left side of the arête gaining a huge spike on the arête itself. Move steeply up rightward to gain an obvious undercut spike by the crux of Nightride just to your right. Pull out leftwards onto wonderfully sculpted rock to awkwardly gain the Nightride stance. 2. 15m, 4c…move up and left to gain the loose finish of Dream Seller, or more sensibly follow the last pitch of Nightride. The steep line between Nightride and Heroin has a fairly serious feel with some ‘adventurous’ rock. The overhanging chimney in the back of the deep bay 15m left of the square block. 1. 45m 5b. Climb the chimney and cracked groove until it steepens. Traverse left across the steep wall to a small block stance. It is also possible to climb this pitch direct. 2. 10m 5a. Continue up the groove above to the top. The next chimney left of Heroin. The lower part of the arete on the left of Heroin is split by 3 short grooves. This climb goes up the centre groove, then up a crack in the wall above. Start from the Heroin bay, scramble up to take a belay below the groove. 1. 45m 5c. Climb the groove, stepping left to climb the wide crack to a good stance. The initial hard moves can be avoided by climbing the left hand groove until it joins the original route. 2. 10m 5a. Continue in the same line to the top. A good bold pitch based on the arete left of Phaedra. Start left of Phaedra. Climb the arete. Turn the roof on the left (thread) and continue up the wall and arete to the top. A steep and sustained outing up the front of the steep buttress left of Phaedra. Really good and maybe worth an extra star the green crack is protectable with care. Start from the Heroinbay. 1. 10m 4c. Move left onto the arete. Descend to low tide level and traverse to belay at the foot of a clean cut groove. 2. 40m 5a. Climb the groove, turn the overhang on the right and continue up the green crack to the top. A strenuous and technical route up a line of thin flakes on the right wall of The Hustler. Somewhat superseded by Mestizo. Start from the belay ledge at the base of the corner (as for The Hustler). 1. 20m 4c. Traverse out right past the central flake line of The Three Musketeers to gain the second flake crack. Climb this directly until below the belay ledge of Mestizo. Move right to a poor stance on the arete. 2. 20m 5a. Climb directly above the stance up thin and then wide cracks to the top. Climb the right arête of Mestizo. Bold at start no runners. You would splash out. Till a thin crack is reached right of Mestizo. Hard moves gain the belay. Awesome wall, I thought it hard above the optional belay and much easier when the big crack was gained. 5a for the lower bit does not seem unreasonable. Start from the belay ledge at the base of the corner (as for The Hustler). Traverse out right past the central flake line of The Three Musketeers to gain the second flake crack. Climb this direct to the ledge in the middle of the wall (possible belay). Take the crack above (crux). Terry Taylor, P. Jones, 7 Sep 1970. Climbed in mistake for Mulatto. Ray Evans later made the same mistake proposing the name Powerit. A great pitch up the wall between Hustler and Mestizo. Step out right to gain the central juggy flake, leading to Mestizo belay. Step left and up to gain the thin crack in an area of black rock, which leads excitingly to the top. Reaching the crack is a little bold, good gear mostly thereafter, though snappy sidepulls. Originally graded E2! The large open corner 20m left of Heroin. The corner faces left and is not visible from the south. A good route and a good introduction to the main cliff. Start from the Heroin bay. 1. 20m 5a. Move left onto the arete and descend to low tide level. Traverse left, past the groove of Hud, and continue round the corner at a slightly higher level, to the belay ledge at the base of the corner. 2. 40m 5a. Climb the steep crack in the right wall. Pass the overhang and continue up the chimney to the top. The corner can also be taken direct at E2 5b. Finds a way between The Hustler and Gringo. Start from the foot of The Hustler. Climb the wall to gain the small right trending corner. Up this to the horizontal break and step right to climb the crack to the top. Jim Moran, Al Evans, 14 May 1978. So called because a solo sea canoeist came up and had a chat to me and Jim while we were climbing it. Al Evans. The wall left of The Hustler. Steep, strenuous climbing on good rock. Start from the foot of The Hustler. 1. 25m 5b. Climb up leftwards to a spike runner. Continue above, then move right into the crack on the face. Climb the crack to the obvious horizontal break. Follow this leftwards to the arete and belay. 2. 20m 5b. Climb the crack on the right of the arete, then move left into the crack above the stance. Continue up this and the face on the right to the top. An eliminate line around Gringo. Start as for that route. 1. 20m 5b. Climb Gringo onto the face. Step left and climb the overhanging groove to rejoin Gringo. 2. 20m 5b. Step right and climb the crack above Gringo p1. This superb new route takes the obvious gap between Gringo/High Noon and Wrangler (which can be clearly seen in the topo on p155 of the Gogarth North guide). 1. 5c 20m. From the ledge below Gringo, go up the arete to spike runners at 6m as for Wrangler, then traverse out left on good holds to jugs at the base of obvious scoop left of the tanned streak. Press into the scoop awkwardly, and then go up to gain a good break and good protection. Make a hard move through the bulge to reach the obvious leftward arcing flake, which leads steeply to great holds up and left and so the belay of Gringo etc. 2. 5b 18m. Climb the finishing crack of Gringo direct from the belay. Awkward and go-ey. Tim Neill and Donald King, June 2012. Wrangles the steep wide crack left of Gringo. Start from the ledge of The Hustler. 1. 30m 5c. Move left to the arete and spike runners at 6m. Step back down and sea level traverse leftwards for 10m until below an overlap. Gain the wide overhanging crack on the left and follow this to a good belay. 2. 20m. Continue easily in the same line. Ed Drummond, Ben Cambell Kelly, 8 points aid. (Al Evans on an earlier attempt) Climbed over 5 days. March 69. Cordon Bleu, Horizon, Dream of White Horses. A linking traverse of the Main cliff, Easter island and Wen Zawn. 26 pitches climbed in a day by Steve Long and Chris Parkin in 19..? steve will have date. SL or CP will sort out description. The following three routes lie above The Hustler. Takes a line up the wall right of the corner via a wide crack. Geoff Milburn and Al Evans, 5 Nov 1978. The big corner on the left provides an obvious and direct exit. Al Evans and Geoff Milburn, 8 July 1978. The crack around the left arete of Minnesota Fats. S Reid and J Roberts, 17/6/1983.